If you call it a multiple personality disorder, Sushama Deshpande won’t mind. The Marathi stage actress on ‘becoming’ the character she has played for 25 years. Sushama Deshpande’s phone has been ringing off the hook all morning. But this call is special. It’s her father, Prabhakar Deshpande calling from Baramati to say, “I’m proud of you”. The 55-year-old actress, playwright and director’s Marathi play, Whaay Mee Savitri (Yes This Is Savitri) completed a 25-year run this Friday, with Deshpande playing avant-garde social reformer Savitribai Phule at every show. It’s meant that Deshpande has spent half her life being someone else, travelling across India and the world to tell the story of the first woman teacher at India’s first school for women. Ten years ago, after she hit the 2,500th show mark, she stopped counting. But the memory of the first 1989 performance is still fresh. After having spent two years researching the work of Savitribai and Mahatma Jyotirao Phule, Deshpande, then a journalist, found herself hungry for more until a chance conversation at the Pune University canteen with the late professor Ram Bapat. “A woman had been raped in Kothrud. I asked sir what would Savitri have done? In that one moment, I realised that I’d weave Savitribai’s history with the state of current affairs,” she says, clutching a pop art mug that holds tea at her Mahim residence. It was decided that the play would open on January 3, 1989, Savitribai’s 158th birth anniversary, and Deshpande would perform for an audience of rural women. This meant she’d have to play the part without the jazz of lights or music. Her script and a bottle of water were her only weapons. Minutes after she had finished, the electricity was restored. But by then, it didn’t matter. Deshpande had left the audience in tears. “I’ve often found myself crying, too,” she admits. “It’s an emotional story of commitment, of change,” she says of one of India’s first activists to have fought untouchability and rooted for women’s emancipation. Although uneducated and married at nine, Savitribai learnt to read and write, inspiring her husband to follow. As if Deshpande couldn’t have done justice to Savitribai’s struggle in the 75-minute stage time, she decided to take the discussion off stage. She’d turn up at the venue early, her box of kumkum and mirror in hand. 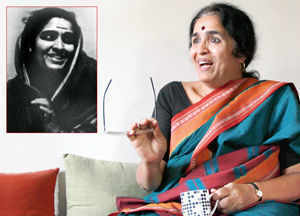 “I’d chat with the women before every performance, telling them of the work Savitribai and Phule had done. They’d watch me turn into Savitribai. At all-women performances, I’d even drape the kashta in front of them. We’d feel like one,” she smiles. Within just a few months of opening the play, Deshpande decided to make it available to anyone who wished to perform it. The message had to spread. “They don’t need my permission. Savitribai isn’t anyone’s property,” says the actress. Since then, the play has had outings in several languages. Currently, a group is performing it in Gujarat. Students from JNU in Delhi have acquired the script, hoping to innovate it. Danseuse Mallika Sarabhai has expressed her wish to perform the English translation by theatre critic and writer Shanta Gokhale.